I love the Transylvania Chronicles. I hate the Transylvania Chronicles. I’ve always been attracted to the “big” modules--your Temple of Elemental Evils, Beyond the Mountains of Madness, The Great Pendragon Campaign, and the like. I’ve also been a fan of Vampire: The Masquerade since 1st Edition, so I suppose it’s not a surprise that its “big” campaigns--Giovanni Chronicles and Transylvania Chronicles--will always hold a place in my heart. I’ve always wanted to play or run these epic games. While I’m not a huge fan of the “meta-plot” that seemed to have taken over Vampire for most of its run, the idea of playing characters experiencing the sweep of history, from the darkest nights of Medieval Europe to the Gothic-Punk world of today (er...the 90’s) just sounds amazing. The problem is, they’ve never really worked for me. I’ve played part of the way through both Giovanni and Transylvania Chronicles. Both ended poorly. In Giovanni, we players got frustrated with the campaign and refused to play it anymore--though I do blame it more on bad communication between the Storyteller and the Players than on anything inherent to the Chronicles itself. Transylvania was a bit more interesting of an ending. There’s a scene where the players are presented with the option to join in on an assault of an ancient's haven (I forget if it was an Antediluvian or a Methuselah); in character we decided that sounded utterly insane. But, we wished the maniacs good luck, and gave them some minor aid so as not to get added to their enemy list. Then, an option was presented to us to try to stop them--which sounded equally crazy. We certainly weren’t PRO Antediluvians, after all! Well, soon after the game came to a halt. Personally, i feel that again, we players revolted, though not deliberately. After being railroaded through the previous several adventures, we were finally allowed a choice, and we chose to do nothing. Come on, we all want to adventure here. But still, Transylvania Chronicles hold a fascination to me. I enjoyed what little I played, and the allure of “epic history” remains compelling. I tried running it again just a few years ago, only for it to end unceremoniously. The truth is, I don’t think I CAN run it as is. It’s too “plot heavy” with little room for character and their own stories. But I’d like to give the Chronicles a go, and see if I can make it work. I’ve had the fortune to be currently running the Great Pendragon Campaign, and it’s really opened my eyes on how to do these “epic” games, and how to have the great arc of history be the spine of a game, while allowing for individual stories and narratives that fill out the meat of it. So, that’s what I want to do with TC--go through it book by book, and “Act” by “Act” to figure out what really matters, what’s interesting and has to stay, and then change, edit and modify to make it into a Chronicle I can run with pleasure. 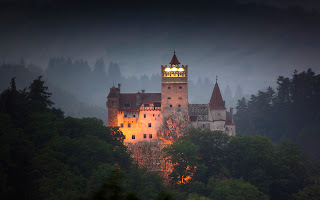 A “Let’s Read” of Transylvania By Night the basic source book for the area that the Transylvania Chronicles take place. This is not just to re-familiarize myself with the setting, but also to make note of cool characters, ideas, and settings that may or may not be fully utilized in the campaign itself. Go through each of the four books of the Transylvania Chronicles, Act (i.e. adventure) by Act. In particular, I want to look at what’s happening in each adventure, WHY it’s happening, if it works as written (and if not, how can it be modified to work better). How much can be kept, modified, or thrown out and replaced? What NEEDS to happen to keep the Chronicle going semi-logically, and what doesn’t? A general outline of how I’d run my Chronicle. I have no interest in re-writing it whole cloth, particularly since that would defeat the purpose of the “epic history.” But, more importantly, It will inevitably end up being radically different based on who the players are, and how many of them there are. Part of me would love to try this out as a Solo Chronicle, but that’s for the future. Oh, i remember those two, have read them far more than ever played or STed them, though i did play Giovanni Chronicles I: Last Supper and my group gave book 2, Blood & Fire a try before it all floundered. Both series are prone to railroading and NPCs racing two steps in front of you, though the Giovanni Chronicles are the worse of the two i think. One thing i'll say in favor of Transylvania Chronicles - with the Appendices and Transylvania by Night as a "backdrop book" there's a much greater effort to provide breathing room for STs to develop their own chronicle, for the acts to serve as a spine, but NOT the whole of it, unlike the Giovanni Chronicles, where actually doing ANYTHING beside jumping from act to act and era to era might utterly ruin continuity. Just the appendix of the FIRST book has 9 pages of historic snapshots or hooks to be played in the centuries between acts, not to mention the other 9 pages on "basic" NPC evolution through the period, with nary a cary about "metaplot" or "big reveals" - what should affect more a coterie, some obscure prophecy/potential lie scribbled by long dead methuselahs or kingdom-destroying hordes of mongols, tatars and/or turks coming to their domains' doorstep? USE these final pages, exploit them, play the books, don't let the books play you by restricting yourself to the spine, it's less than a skeleton.